In both karimc alpha 5 and alpha 6, and the Lucid daily image from 2-24, when starting the empathy IM client, the wizard that starts gives a list of accounts available to create. In this list, IRC is missing. I've seen this both on the live environment and a clean install. The workaround is to exit and go to Edit -> Accounts (F4) and Add an account. IRC is listed in this location. In Lucid, you have to get past the wizard (basically set up one account) this work around. A new user that installs Karmic, may want to get to IRC #ubuntu channel, and this gives the initial perception that they cannot accomplish this. You'll also see that the "People Nearby" account type is absent as well in the Welcome Screen. I have created the upstream bug report and have cross linked the bugs. Thanks for the suggestion. Markus, that is a different option ("Create new account"). This bug is about "use existing account". But it is a bit confusing as "create new" might be understood as "create new account in Empathy (but use pre-existing MSN account)". As the removal of IRC is an upstream design choice (??? ), I suggest getting back Pidgin, which just works. -ChanServ- [#ubuntu-proxy-users] /!\ ATTENTION /!\ This is NOT #ubuntu. | You have been sent to this channel because you are using a proxy service such as Tor or Cgi:IRC. There are better ways to be anonymous. | CGI:IRC users, try connecting to freenode via port 8000, 8001 or 8002. This _may_ bypass your firewalls | Please type !proxy for more information. A video of the problem in Lucid, and how frustrating this could be for a new user trying to get to an irc channel. "Empathy is currently a pretty poor IRC client so I think the current UI makes sense. There is some vague plans to create a separated Telepathy client for IRC/Muc chat." Thanks, I see that comment. It makes it frustrating that Ubuntu changed from pidgin to empathy. 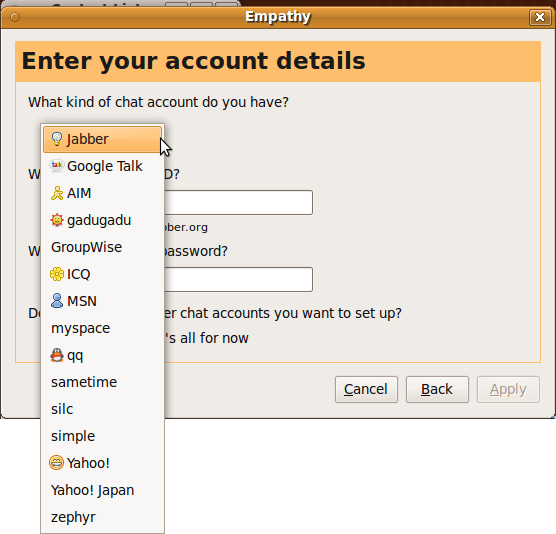 Ubuntu replaces pidgin, which does great with IRC, with empathy (I'm not sure why, but maybe there is a reason). Then the developer of empathy basically says empathy does such a terrible job of supporting IRC that its worth frustrating a person setting up an IRC account so that they won't use it with IRC. 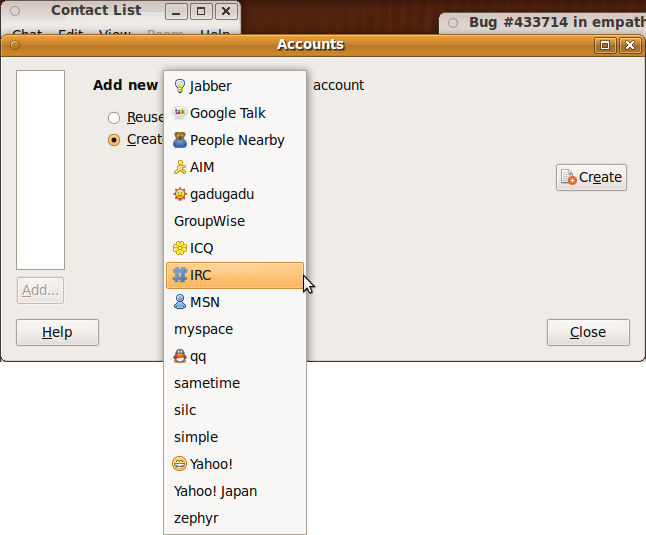 As I see it, Ubuntu went from supporting IRC with pidgin to not supporting it (or supporting it badly). (And all the Ubuntu support related chat channels are on what protocol?) Doesn't that fit the category of regression? This is still present in Lucid Beta1. First account creation does not give IRC as an option. Creating any other chat account first then allows you to create an IRC account as the second account. first time user of empathy, I dont have any other chat accounts and can not work around this bug. besides being installed by default i would not even had known there was support for irc in empathy if gnome.org didn't list it as a recommended irc client. in ubuntu's defense https://help.ubuntu.com/community/InternetRelayChat does not list empathy as a client so hopefully people will not expect the support. I had to create an account for a service I dont use, just to get passed the wizard, and add an irc account. UI fail. If the initial list is too long, have a "more..." option or something like that. This issue is still present in Ubuntu 10.04 "Lucid Lynx". as said before this bug will be fixed in empathy 3.0 and triaged means that this bug does not need any other information. its complete. I completely disagree with this bug being labeled of 'Low' importance. Note that this is important enough that it will need to be included in the liveCD of Ubuntu 10.04, Lucid Lynx when it gets updated. Otherwise since Empathy is the default IRC client new users of Lucid may mistakenly think IRC is simply unavailable to them. This is vital because our #ubuntu-beginners, #ubuntu, and many other support IRC channels are critically important to new users. nUboon2Age, generally importance is not relevant for upstream bugs. I talked to the empathy developers a month ago and they will fix this bug in the upcoming release of empathy. >> empathy_protocol_chooser_set_visible display IRC in the Assistant? Maybe you can verify this in some way to add support for getting the fix in GNOME 2.32, and therefore into Maverick. I think this fix needs to be put into 10.04.1 . As i wrote above, this is a serious problem for supporting new users and since 10.04 is an LTS we could be faced with this issue for a long time unless the fix is added to the LiveCD. I continue to believe this should be raised from 'low' importance to at least medium or high for empathy (Ubuntu). Thing is, this is a GNOME problem, we need them to fix it first. That's what I'm trying to do, expedite getting a fix. I get the feeling, both from what Omer says and from looking at the GNOME bug, that the GNOME people think it's a fair bit of work. If I'm right in my analysis of the code, it's trivial. Whatever encouragement we can give to the GNOME people to verify what I found and get a fix out quick will be best for everyone. Then we figure out if it can be backported to Lucid. @ Jeff how about we fix it and push it upstream to GNOME instead of waiting for them? Lately that's what we (Ubuntu and Canonical) been criticized for failing to do. If it is trivial then we can 1) solve our problem and 2) be heroes to GNOME and good FLOSS community members simultaneously. Obviously i misspoke above and it would have to be 10.04.2 since 10.04.1 has already been shipped. > both on the live environment and a clean install. > wizard (basically set up one account) this work around. > and this gives the initial perception that they cannot accomplish this. to reach irc support channels be available from the start.